Becoming a parent brings a lot of responsibilities and emotions. Have you ever felt overwhelmed with the challenge of making decisions that are right for your child, knowing it all rests on your shoulders? In the show True Detective, Mahershala Ali tells his son how courageous he was before becoming a parent. “I did things some people might even call brave, but you made a coward of me. I’ve been terrified since the day you were born,” he admits. I think these feelings are in all parents, including myself. USA Today published a study by the Journal of the American Medical Association that revealed the harmful effects of white noise machines on children. I realize after digger deeper and studying for myself that the headline was misleading and blown out of proportion. The headline, “Caution Urged for Infant Sleep Machines,” claimed white noise machines, “could place infants at risk of developing noise-induced hearing loss.” This certain study tested 14 different white noise machines and the volume of noise they put out at various distances from the sound meter. This test was to mimic where the device would be located when in a baby’s room. The results of the test showed all of the machines exceeded 50 decibels at three feet from the noise sensor, and 50 decibels is the recommended noise limit for hospital nurseries. So from this report, you can conclude there is not a machine on the market that is safe for your baby’s hearing. Exactly how loud is 50 decibels? When measuring decibels, you can’t think of it as two is twice the amount of one, and ten being half of twenty. Fifty decibels are in fact, one fourth as loud as 70. It would be the same as a quiet suburb or a quiet conversation at the house, according to the Noise Sources and Their Effects Sheet from Purdue University. This explains why pediatric nurseries are asked to keep the noise below 50 decibels – to create a sleep-friendly environment for the babies, not a concern for hearing loss. At 50 decibels, there is not a potential for damage to the babies’ ears. Three of the 14 machines had the capability to reach over 85 decibels of white noise. This would be closer to the sound a blender or garbage disposal makes. The North American occupational health and safety associations recommends you wear hearing protection if you are exposed to this noise level for a full workday. So, admittedly, there is potential for damage if you had one of those machines on full power near the baby’s crib, and parents should be warned about that possibility. Remember, always try the machine in your room before placing it in the child’s room. You probably wouldn’t sleep well with a garbage disposal-level noise machine next to your bed. Be honest, could you sleep with a lawnmower next to your bedroom window? Use common sense and do not turn the sound machine to full blast and leave it overnight next to the crib. The study could be a rational one, but when done to induce panic and try to get parents to visit their website is not responsible. It is important to warn parents about the potential harm, but it should be done in a non-panic-inducing way. One thing everyone can agree on is we all need sleep and good sleep at that. Sleep is a necessity, not a luxury. We thrive when it is prioritized in our life, and we suffer without it. So, if your baby sleeps better with a white noise machine in their room, use one. Keep the volume at a reasonable level that you have experimented with in your own room, and you will be helping them receive the sleep they need to be happy and healthy. You are providing them a foundation for which to grow and learn. Being a parent is no easy task! When you have a little one struggling to sleep, you wonder if you are doing something wrong, especially if this is your first baby. Most of the time there is nothing seriously wrong, you just need a few adjustments to your routine and, of course, some patience along the way. Are you ready for a good night’s sleep for the entire family? Contact Adele Thompson Sleep Consulting and through phone and email support, I will design a sleep plan customized for you and your family. Teaching your child to learn how to sleep through the night is possible! Contact me today at 415.691.1298. 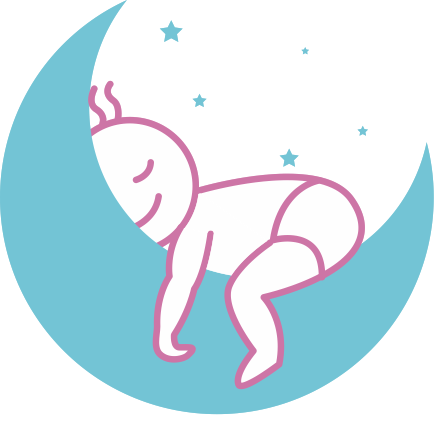 Download The Five Steps To Getting Your Baby To Sleep Through The Night for free!